We are a Yorkie breeder and offer Yorkie Puppies for sale from AKC champion Yorkshire Terrier show dogs that we show and finish at AKC events. We are Yorkie breeders that strive to breed the very best with the purpose of acquiring our next show dog. This type of breeding offers nothing but the best in quality and health for your next Yorkie puppy, as we choose only one puppy to keep for a show prospect from a litter. We hope you enjoy our website and find it informative and relative to the Yorkie in your life, or to assist you in adding a beautiful well bred puppy to your life. We try and provide a vast amount of information on how to care for, groom, train, troubleshot and any other topic that could be helpful about Yorkshire Terriers. When you want to get a quality Yorkie, then the best way that you can do so is to look for an exceptional Yorkie breeder. The breeders differ in quality of dogs and you need to do your research for you to be able to find the best one, as this is an important investment. Bad health of a dog can cost a lot of money later down the road. Among the things that you have to consider is to find out if the breeder is quite knowledgeable about what is correct in the breed, and also in evaluating the Yorkshire Terrier’s quality; know if the breeder is ethical, honest and one who is of good business practice. Note that the breeder that you find should also work on the improvement of the breed. This can only be verified through showing their dogs at AKC events. With this, you will be able to find the kind of Yorkie that is great in quality. It is really very important that you find a breeder who has an extensive knowledge about the health problems that a Yorkie may have. One should also know how the dogs pedigree and quality dogs behind puppies for sale. Being a buyer, you are dependent on the information provided by the breeder. For you to be able to recognize the quality of the dog, you need to have verification of such. We Are The Home and Breeders of America's Number 1 AKC Yorkshire Terrier ! Yorkies, short for Yorkshire Terrier, make great pets as they form such deep attachments with their owners and family. Yorkshire Terrier puppies are truly irresistible. One look and it is hard to resist their pick me up attitude. Their loyalty speaks for itself as a Yorkie is a true friend for a lifetime. They are somewhat of a clown as they can be pretty silly and entertaining along with be very glamorous at the same time. They have the silkiest luxurious coats that just flow as they strut with self-confidence. It is among the most beautiful in the canine world. Their hair is like human hair and will continue to grow unless cut. The puppy has a coat that is black and tan. As the puppy matures, the coat transforms into a beautiful steel blue and gorgeous gold. With proper care their silky coat can be the most striking feature of this little breed of dog. This silky coat, which is only found on correctly bred dogs, is what this breed is most noted for. They characteristically weigh between 4 to 7 pounds at maturity. It is often thought that Teacup Yorkies, weighing approximately 3 pounds, is another variety of the breed. This is simply not true. Even if a dog weighs less than 3 pounds fully grown, it is still just a Yorkshire Terrier that is running small. There is no variety know as miniature Yorkie or teacup Yorkie. But no matter how small, there is nothing minuscule about them and they can even be known to be fiercely protective of its owner. It bonds quickly, and loves nothing else than to end the day in the lap of its owner. Due to this breeds intelligence, training can be trouble-free. Yorkies crave affection from their owner because of their unmatched devotion, and therefore positive reinforcement and praise is the best training technique for the breed. House training is easy due to this. Yorkies give back to you not only endearment but companionship and entertainment as well. If you have never owned one, once you get a Yorkie Puppy it will be then that you know that you really can buy love. Just be assured that you get the BEST LOVE YOUR MONEY CAN BUY. We hope you enjoy our website and find it informative and relative to the Yorkie in your life, or to assist you in adding a beautiful Yorkie puppy to your life. They are truly an amazing little breed of dog. We breed to show our Yorkies at AKC dog shows in competitive events to earn a Championship on our dogs. We enjoy this hobby of ours as it has become a true Yorkie Passion for our family. We are very passionate about this breed and strive to achieve only the very best in health, temperament and structure in all our puppies.Â We breed with the purpose of finding our next dog to show and conform strictly to the AKC Yorkshire Terrier breed standard. All of our Yorkie puppies will not of course meet our rigorous critique of being a show dog, but those that do no will make a perfect choice for those looking for a yorkie puppy as their next pet. Our puppies are bred for optimum health, structure and of course, adorability. That makes for a great addition to your family as well as ours. Due to this stringent breeding process is just another reason it is wise to purchase your next pet from a show breeder. Though they might not be the cheapest Yorkie puppies you can find, they will be the very best Yorkie puppy your money can buy. Puppies from non AKC show breeders, lack the quality and genetics behind their puppies. This lacks any process to validate their breeding program and they most likely lack in areas such as health, quality and overall good looks. So when buying your puppy why not buy one that will be consciously bred by Yorkie breeders, that breed for themselves to go into a show ring. 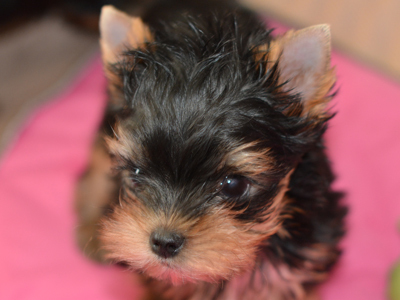 It will certainly lead to the healthiest and most gorgeous Yorkie puppy you can find! Every Yorkshire Terrier Litter that we whelp is out of one of our Yorkshire Terrier Champions. To finish a AKC Champion Yorkshire Terrier in the confirmation ring is not only very expensive, but also requires a lot of time and dedication to obtain this goal. It is imperative to validate our Yorkies correctness to the breed standard of which they are judged to in the show ring. Yorkies should not be bred for any other reason as that is the only way to prove correctness. Breeding for the betterment of the breed can only be done in this manner. Artistry Yorkshire Terriers stands behind each and every puppy that we breed. We offer an extensive health quarantine along with health screening and micro-chipping prior to any puppy leaving. Contact us for current availability. It is not hard at all to find a Yorkie puppy for sale, but if you are searching for a Yorkie that truly represents the breed, then you need to choose your Yorkie breeder carefully. 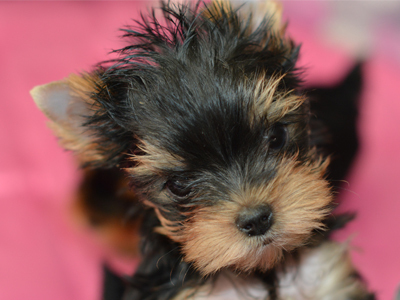 Do not be fooled by Yorkshire Terrier breeders who are selling Yorkshire Terrier puppies for sale with labels such as teacup Yorkie puppies for sale or tiny teacup Yorkies. No separate type of Teacup Yorkie exists, nor does miniature Yorkshire terriers for that matter. Using labels like these is deceptive. Another type of Yorkie breeder to be aware of is those that advertise off colors or rare colors. These unacceptable colors include chocolate Yorkies | blue Yorkies | parti-colored Yorkies | red Yorkies | and golden Yorkies just to name a few. 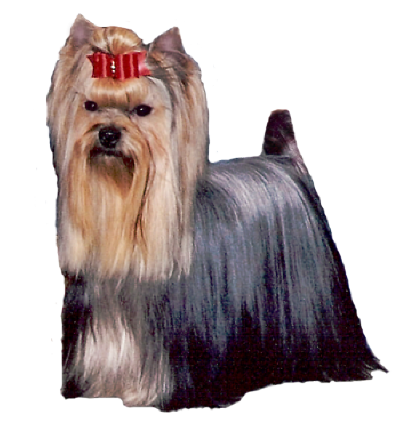 These colors are not rare but are uncommon because reputable Yorkie breeders have selected against these incorrect colors for generations as they are not correct and many times are even associated with health problems in the breed. Only disreputable breeders would breed these incorrect colors in Yorkshire Terriers on purpose. 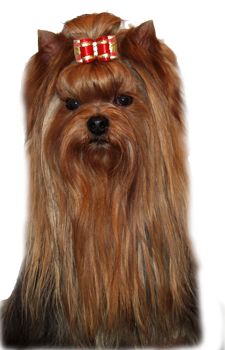 A good source to find a good Yorkie breeder is at a dog show, or Online to locate dog show exhibitor. Show breeders dedicate their efforts to producing high-quality dogs. To do this, they breed toward an ideal Yorkie as described in the breed standard of which they prove this correctness by taking their dogs to competitions to achieve a Championship in American Kennel Club events. They also screen them for hereditary health problems. Nonetheless, not every puppy is competition quality therefore some puppies will be offered to pet homes. These pet quality puppies are where you can profit as they will be the best in looks, structure, temperament, health and correctness toward the breed. Temperament is an important attribute that should not be overlooked. There are some dogs that get diseases because of a poor diet. Some dogs are suffering from cancer and diabetes and if you do not want this for your pet, then you should be always ready to offer a nutritious meal. Feed your dog good quality food so that it will maintain its health. Take steps to obtain a healthy as to assist your dog in prolonging its life and overall health. First is to know the nutritional requirements of your Yorkie. Begin by discussing this with a reputable nutritionist or holistic veterinarian. Then you have to research on your own. Make sure that you read the labels on the dog food that you are purchasing for your pet. Ask those you know that have the same breed of dog as yours. Female Yorkie Puppy For Sale. She has AKC Champion Parents both sire and dam. Visit Our Yorkie Puppies Page for more details and to see other puppies we currently have for sale to qualified pet homes. All the Best to our newest Yorkie puppies Buyers: The Brice Family in Baton Rouge, Louisiana on thier new adorable tiny male Aritstry Yorkie puppy and the Puzaitzer family in New York City on their new little doll female Artistry Yorkie puppy.